Having just finished reviewing Bernhard Paumgartner’s wonderful 1966 recording of K543, I confess that my heart sank a little at the prospect of turning from that “full-fat” version to a vibrato-free chamber orchestra half the size of the Mozarteumorchester. 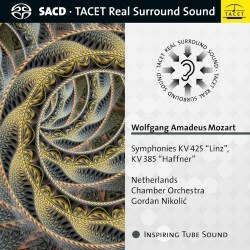 Apart from the differences in scale and interpretative approach, the sonic properties of this issue are very different, too, being a multi-channel SACD ‘Real Surround Sound’ recording, whereby the engineers seek to recreate a concert hall experience by placing the musicians in a circle whose dimensions are proportionate to the number of performers involved, facing the centrally placed microphones. Repeats are observed and the musicians use primarily modern instruments but, in a nod to period style, natural horns and trumpets, and timpani played with wooden sticks. I need not have worried; the technological innovation is matched by the musicality of the execution. My understanding is that although Gordan Nikolić, familiar to UK audiences as the former concertmaster of the London Symphony Orchestra, oversees the project, there is no conductor as such, as the players obviate the need for one by constantly observing each other in the round; it seems to work, as these are crisp, neat and energised. The slow movements are stately and dignified but do not drag, although the Andante of the “Haffner” in particular is very measured and if the finale of the “Linz” could be more of a true Presto, it is still sprightly and delicate. The balance among instruments is ideal; it is lovely to hear the woodwind so distinctly. Sometimes the artists’ breathing is too acutely caught by the microphones and just occasionally I would have liked a modicum of vibrato to help sustain a longer phrase more elegantly but those are minor cavils. In manner, these performances reminded me of favourite versions by Pater Maag and the Orchestra di Padova e del Veneto on the Arts label, although he does not take the repeats. These are thoroughly enjoyable recordings in exemplary sound.